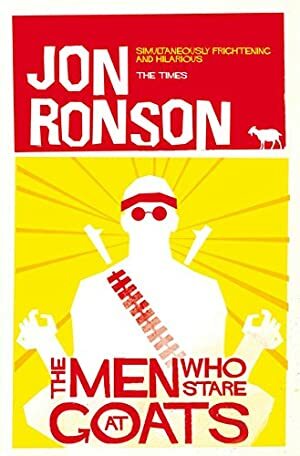 Often funny, sometimes chilling and always thought-provoking, journalist Jon Ronson's Sunday Times bestseller The Men Who Stare at Goats is a story so unbelievable it has to be true. In 1979 a secret unit was established by the most gifted minds within the US Army. Defying all known military practice - and indeed the laws of physics - they believed that a soldier could adopt a cloak of invisibility, pass cleanly through walls, and, perhaps most chillingly, kill goats just by staring at them. They were the First Earth Battalion. And they really weren't joking. What's more, they're back and fighting George Bush's War on Terror. Inspired the film starring George Clooney and Ewan McGregor. Track It. This book has been £1.19 within the past year. Log In to track Jon Ronson on eReaderIQ. to be notified each time the price drops on any book by Jon Ronson. to stop tracking Jon Ronson. We started tracking this book on August 20, 2011. This book was £5.26 when we started tracking it. The price of this book has changed 251 times in the past 2,802 days. The current price of this book is £3.79 last checked one hour ago. This lowest price this book has been offered at in the past 90 days is £3.42. This lowest price this book has been offered at in the past year is £1.19. The lowest price to date was £0.69 last reached on August 14, 2012. This book has been £0.69 one time since we started tracking it. The highest price to date was £6.99 last reached on January 10, 2019. This book has been £6.99 20 times since we started tracking it. We last verified the price of this book about one hour ago. At that time, the price was £3.79. This price is subject to change. The price displayed on the Amazon.co.uk website at the time of purchase is the price you will pay for this book. Please confirm the price before making any purchases.